The benefits of Thunderbolt 3 and its 40 Gbps link are best realized in a daisy-chain configuration involving multiple high-bandwidth I/O peripherals. The Alpine Ridge Thunderbolt 3 controller in a host connects to the CPU using a PCIe 3.0 x4 link. From the perspective of a single device that is not a huge drive array, it is likely that a PCIe 3.0 x4 SSD is best suited to fully utilize the available bandwidth. AKiTiO recently started selling their Thunder3 PCIe SSD. It puts a 1.2TB Intel SSD 750 PCIe 3.0 x4 NVMe add-in card in a standard two-port Thunderbolt 3 aluminum chassis along with a dedicated DisplayPort output. AKiTiO is one of the first vendors to come out with Thunderbolt 3 peripherals. We have already reviewed their first offering - the Thunder3 Duo Pro 2-bay DAS. It turned out to be a great introduction to the Thunderbolt 3 peripheral market (especially considering that it was the first one out of the door). A 2-bay DAS was never going to make the Thunderbolt 3 controller sweat, even with a couple of SATA SSDs in it. AKiTiO's second Thunderbolt 3 product, the Thunder3 PCIe SSD, goes all out in search of the performance crown. The Thunder3 PCIe SSD is meant for desktop use and needs an external 72W power adapter (12V @ 6A). In addition to the main unit and the power adapter / cord, the package also includes a Thunderbolt 3 cable (capable of 40Gbps data transfer). A cable-tie, quick setup guide, warranty terms and a reminder to update to the latest drivers / firmware for the host PC are also included. The detailed specifications of the unit are provided in the table below. The gallery below takes us around the aluminum chassis and the internals. There is a LED indicator in the front panel to indicate power / access status (doesn't light up unless both the power adapter and Thunderbolt link are active). There are perforations in the front panel, and a fan directly behind it. The opening mechanism is similar to the Thunder3 Duo Pro - loosening the two tool-less screws in the back panel allows the chassis to slide out. It is possible to replace the fan, if needed. However, the installed PCIe SSD (add-in card) can't be taken out without voiding the warranty. The main board seems to be based on the inXtron Thunderbolt 3 Hardware Development Kit. The board also contains Alpine Ridge in its dual-port form (Intel DSL6540). Unlike the Thunder3 Duo Pro, the setup process is plug-and-play. There are no RAID buttons on the unit. However, it is necessary to install the Intel NVMe drivers in order to get the best performance out of the product. 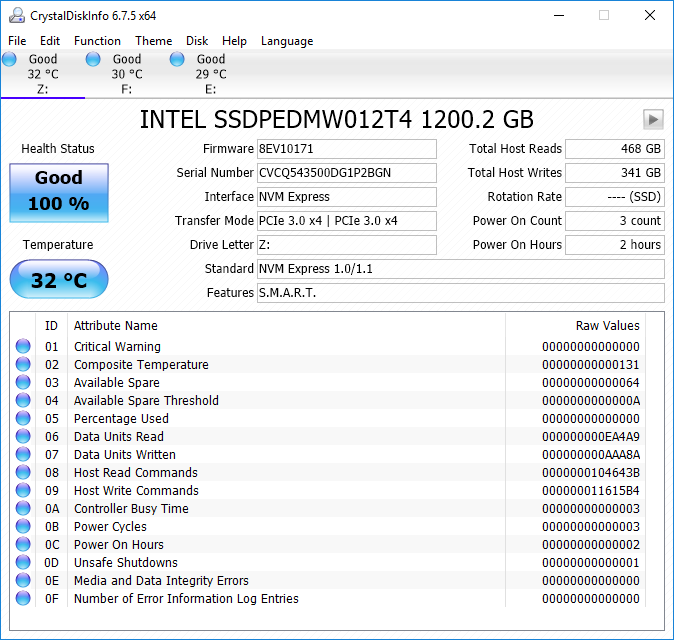 The Intel SSD Toolbox also allows users to monitor the health of the SSD 750 inside the Thunder3 PCIe SSD. A bus-powered enclosure would have been nice, but AKiTiO has opted to go for a more versatile solution with a dual-port design. The second port can also be used to connect another Thunderbolt 3 or USB 3.1 Gen 2 or any other Type-C peripheral. That device can sink power too - which leaves no option for AKiTiO. An external power adapter is definitely needed. The Intel SSD 750 inside the enclosure is visible as a physical disk on the host. SMART attributes can be tracked, and, for all practical purposes, the SSD 750 is a PCIe 3.0 x4 NVMe drive connected to the host. The specifications of the Intel SSD 750 1.2TB drive in the Thunder3 PCIe SSD are summarized in the table below. When I first saw the title I thought, hell yea. 1. The enclosure isn't very large, so a long video card wouldn't fit. 2. It doesn't have a power connector for video cards that require more than the PCIe bus provides. 4. It only has a x4 PCIe slot, that doesn't appear to be open-ended, so no x16 cards. I'm surprised that no one is mentioning the fact that the development kit mentioned by Ganesh is available for $280 with free shipping and comes with a x16 PCI-E connector, Thunderbolt cable and everything needed to get started. It also has a pretty standard power connector for providing bus power up to 75W. For more powerful video cards, one could easily buy one of those kits, install it in some off the shelf mini-ATX/mini-ITX/fancy custom case with a reasonably large ATX power supply (350W would be plenty for a single card) and have a nice custom made graphics card enclosure.